This species is responsible for the most shark bites in Florida. People aren’t the only ones heading to Florida for warmer weather. Over 10,000 sharks have situated themselves just off the Palm Beach County coastline for the winter, although further north than usual. The blacktip sharks are only several hundred feet away from the shore, according to Stephen Kajiura, an associate professor at Florida Atlantic University whose research interests include the sensory biology of fish. “It’s not unusual, but it’s great to see them,” Kajiura told ABC News today of the number of sharks, which average six feet in length. 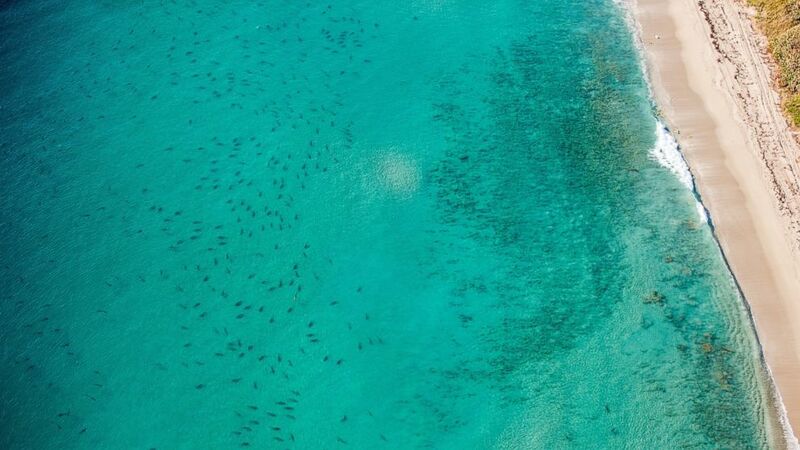 (Courtesy Mark Mohlmann) Over 10,000 sharks have migrated down to the Palm Beach County coastline of Florida for the winter. Dr. Stephen Kajiura, professor at Florida Atlantic University, said it is not unusual for so many sharks to be down in Florida during this time of the year. He explained how the blacktip sharks usually migrate further south in the Miami-Dade and Ft. Lauderdale area, but this year have stayed near Palm Beach north to the Jupiter Inlet. “One of the ideas may be that as they are getting south, if they are in a suitable habitat, then why not stay,” Kajiura said, explaining why the sharks may have not traveled further south along the Florida coast. Part of his research consists of aerial surveys. In a video he took during one of the aerial surveys, countless sharks can be seen near the shoreline. “That fishing boat’s having a blast,” Kajiura says in the video of a boat right on top of where the sharks are swimming. While there are thousands of sharks in the waters, it hasn’t deterred people from going to the beach. Lifeguards have not shut down any beaches yet, according to Kajiura, and most of the locals in the area know this is when the sharks are around and what precautions to take. And even though blacktip sharks are responsible for the greatest number of bites in Florida, none of the attacks have been fatal. The sharks are usually in the area from January to mid-March, according to Kajiura, and then they will swim further north to the Carolinas.